As the purple martin season for 2010 winds down in the Southern states and hope for wannabe landlord dwindles, I have heard some folks wondering where their purple martins went. Some established colonies have even reported the complete failure of their colonies to arrive at all. In this article by Cynthia Porter from the Winona Post she describes some landlords experience with colony loss. There was some speculation about “where the martins have gone” and I hope to add some clarity to that issue. 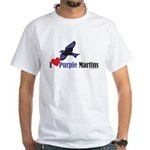 As far as why YOUR purple martins never arrived; there is only really one reason. The colony experienced losses of adult birds, nestlings and fledglings due to predation, weather extremes (cold or drought) greater than the rate of reproduction. In cold weather (temps of 40 degrees F or below) aerial insects are not available and starvation will occur within days. Record Low temps for record breaking extended periods of time, made foraging for food impossible for many purple martins. So birds that may have arrived early, didn’t survive this year. 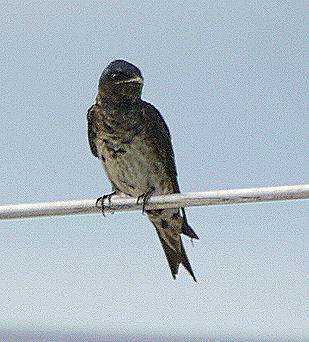 Purple Martin landlords often report of “early arrivers” braving intense spring cold snaps for days and even with poor weather forecast, martins will often times continue their journey Northward and remain at their colony site. Many landlords last year and this year reported huge losses of ASY (adult) purple martins from cold snaps such as these. Droughts were widespread and severe in many areas in 2008 even more so in 2009. Reduced rain results in reduced amounts of aerial insects thus reducing available food supply. Large losses were reported last year of thousands of dead nestlings that starved to death. According to Louise Chambers of the Purple Martin Conservation Association, “.We don’t know if adults will return after total nesting failure” so even though “many landlords are reporting a very good season this year” it could be that those adults returned or their sites attracted new adults. The most important factor and the one WE CAN DO SOMETHING ABOUT, is predation. Most predation goes undiscovered. Without safety precautions, such as predator guards in place, raccoons and snakes can easily climb ANY martin pole and go from martin nest to martin house for an easy meal. A colony can be decimated within days. Once a gang of raccoons finds the tasty treats (your birds) at the top of your purple martin pole, it will climb every pole in the neighborhood. 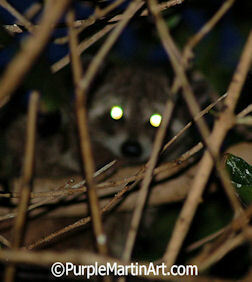 And believe me, I have seen it Raccoons DO eat birds! Last year at our local roost, I witnessed raccoons dining at their leisure on so many purple martins that their body parts littered the ground like confetti. You can read the post here: Davie Fla Roost. One of the reasons why the Purple Martin Conservation Association recommends nest checks is to discover problems early. By discovering problems such as nest predation, you can monitor the health and growth of your colony. Many landlords that report complete colony abandonment have in fact been suffering chronic losses and/or predation. The ultimate failure of many colonies could have been avoided by careful observation and having predator protection installed. So to conclude, if you don’t observe your martins and perform nest checks, your colony may have suffered losses of adults from cold weather, losses of nestlings due to dry weather and, if unprotected, losses from ground predators as well. Then that is why you had no martins return at all. If you are interested in reading more about raccoons and the threat they pose, try this article titled, “Raccoons in our Midst”. It’s official, the last of the nests have fledged and all the babies have taken to the air. A hawk was making daily visits and though I am sure (s)he got at least 2 fledglings, I am sure more fell victim. I was unable to get a good look so I am hoping it was the resident Red Shouldered Hawk, a slower and larger hawk that poses a formidable threat but less so than the smaller faster Coopers Hawk that are common in South Florida also. The Red Shouldered hawks nest close by and protect this as their territory from other hawks. If that can be counted as protection…I am not too sure. Night time is quiet and I am not sure if many martins are returning to the nests to roost at night. They may have moved on to a local assembly area or pre-migratory roost. The fact that I am talking about the roosts already almost sounds crazy! Can time have flown by so fast? I guess I will start planning another trip to the roost in Davie this year. It has almost been exactly a year since I went to see it and video taped it. You can see it at my blog post titled Purple Martin Pre-Migratory Roost Spectacular. It is a great YouTube clip taken at the roost with swarms of purple martins. The webcam will not be up again for the remainder of this year as the computer I had it running on is dead. I plan on replacing it as soon as I can and it will be up again next January. I promise.